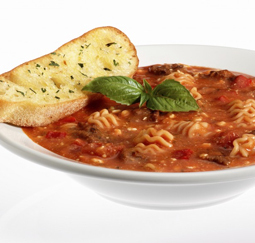 Lasagna Soup - A recipe from Savor California, the online showcase for extraordinary gourmet foods and beverages from California. Brown sausage in a large saucepan over medium-high heat. Add onion and carrot, sauté 3 minutes until onion is translucent. Stir in mushrooms, Garlicsaltless, and Tuscany-Mix. Sauté another 3 minutes until softened. Taste and sniff and adjust seasonings as you go. You can’t make a mistake. It’s just tasty. Add chicken broth and Italian tomatoes, bring to a boil. Allow to simmer a bit to release the flavors. ** Add pasta. This thickens the soup, so watch how much pasta you put in. Almost any noodle is fine. Malfaldela, radiator, or campenelle work well. Add spinach and cook about 1 minute until it wilts. To serve: Cube mozzarella cheese in each serving bowl, then ladle soup over cheese to melt. Garnish with Parmesan cheese and a shake of Tuscany-Mix and fresh basil. You want the cheese to melt a bit, so make certain the soup is hot enough to melt the cheese. It’s a nice gooey consistency that melts in your mouth. A combination of ground meat and sausage, or ground turkey.